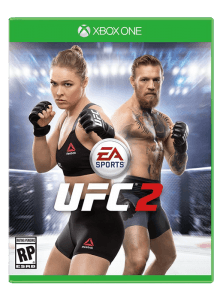 EA Sports released UFC 2 on 3/15/16 and I’ve been playing hard since then. Ultimate Team ranks players who compete online. I was playing some Ultimate Team online matches for the stream yesterday and got paired up for a really good fight with fighter that was ranked 9 levels higher than me. The opponent was a level 82 overall fighter, Bailey Baeson. My fighter, Olga “Downtown” Hall is a 73 OVR Greco-Roman fighter (with a glass jaw). This made for a 9 level difference in fighter rank. Can Olga take down Bailey in the octagon? This is what happened in the UFC ranked match between Olga Hall v. Bailey Baeson on UFC 2 Ultimate Team.